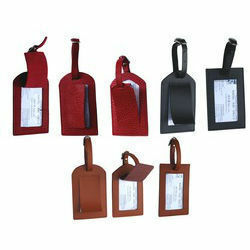 We are offering an exclusive range of Leather Luggage Tags, which is manufactured using quality leather. The range that we offer lends a luggage a unique identity. Further, the tags are highly durable in quality and can be easily fastened. Looking for Leather Luggage Tag ?